Education leading to real jobs is the key to addressing the challenges faced by Aboriginal people in Australia today, according to a speaker at the upcoming Charles Darwin Symposium. The Director of pepperedBLACK security, Des Rogers, will outline some of the approaches to these challenges during in his presentation Regional and remote employment - seeking to celebrate success at the Symposium in Alice Springs on 28 September. “Educators must be taught the importance of teaching a full curriculum to students in remote communities and avoid the concept that the students will never leave their communities,” Mr Rogers said. 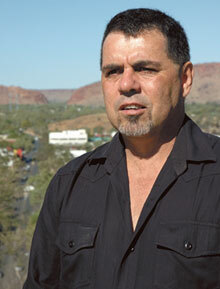 Mr Rogers is an active member of the Alice Springs community and is a board member of Desert Knowledge Australia; a member of the Alice Springs Economic Development Committee; and a member of the Northern Territory Government Economic Development Framework Progress Group. He said he believed education was the way forward for Indigenous people so they might master the lore of modern society which was also the catalyst for positive societal change. Mr Rogers’ presentation will form part of the free public forum titled A Skilled Workforce for Regional and Remote Australia: Keeping, Attracting, Training. The forum is designed to generate discussion and debate about the ideas of workforce development, with a keen eye on various existing and future alignments of people, skills, work, structures and place. The Symposium will run from 8.30am to 5pm on Friday, 28 September at CDU’s Alice Springs campus and is open to members of the public. Entry is free. For more information go to www.cdu.edu.au/cdss.